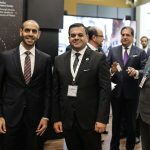 The Sharjah Investment and Development Authority (Shurooq) is promoting the emirate’s status as one of the Middle East’s most progressive and dynamic tourism destinations to 180 countries across five continents at this year’s ITB Berlin, the world’s largest travel trade show. Its participation comes as part of a delegation led by His Excellency Marwan bin Jassim Al Sarkal, CEO of Shurooq. Highlighting Sharjah’s authentic heritage, cultural locations and eco-friendly hospitality, Shurooq, participating under Sharjah Commerce and Tourism Development Authority pavilion, aims to attract interest from more than 160,000 visitors and industry leaders at the event, which began today (Wednesday) in Germany’s capital, Berlin, and ends on March 11. With its unique portfolio of projects, the focus will mainly be on such developments as Mleiha Archaeological and Eco-tourism destination, Al Montazah Parks, Al Bait Hotel and the hospitality projects under Sharjah Collection. Providing investors and visitors with latest insights and investment plans across Sharjah’s authentic and cultural tourism and hospitality sector, Shurooq will outline services and features on the Sharjah Collection developments, which comprise of Al Badayer Oasis at Al Badayer desert; Bait Khalid bin Ibrahim in Heart of Sharjah; Kingfisher Lodge in Kalba as part of the Kalba Eco-tourism project; and Fossil Rock Lodge at the Mleiha Archaeological and Eco-tourism project. The Kingfisher Lodge is 90% complete, while the Fossil Rock Lodge stands at 80%. Additional projects developed by Shurooq and exhibited at ITB Berlin 2018 include Al Qasba, Al Noor Island, Heart of Sharjah, Al Majaz Waterfront and Flag Island. As Sharjah’s tourism sector continues in its rapid growth, Shurooq is investing heavily in environmentally responsible luxury hospitality in natural areas that conserve the area’s environment and natural habitat, as well as improve the welfare of local people. Although 35% of tourists around the world are likely to book eco-tourism holidays, according to GlobalData, the Middle East is still a niche market and Sharjah has established a position as its leading eco-destination. Al Bait Hotel is a truly authentic Emirati hotel, designed to offer guests an exceptional hospitality experience in Sharjah. Providing 53 keys, the five-star hotel combines traditional and modern features will be a prestigious hospitality and heritage landmark located in the Heart of Sharjah. The Kingfisher Lodge is a luxurious tented camp offering a unique hospitability experience within Al Qurm Nature Reserve in the heart of Kalba. Al Badayer Oasis is expected to become one of Shurooq's premium leisure and adventure destinations in Sharjah. The project will feature a unique set of experiences for desert adventurers within the golden dunes of Sharjah’s Central Region. The Mleiha Archaeological and Eco-Tourism Destination is among the most prominent and promising tourist attractions in Sharjah, outlining the emirate's history and heritage as part of the UAE's civilisation and culture. Al Noor Island is one of Shurooq's most impressive new tourism and leisure destinations. Located in Sharjah's Khalid Lagoon, opposite to Al Noor Mosque, the island combines a perfect blend of nature, art and architecture.